UNITY highlighted at Reservation Economic Summit – UNITY, Inc.
“The title of the panel presentation ‘Generation Next: Encouraging and strengthening the next generation of American Indian and Alaska Native youth’ speaks to what we’re doing at UNITY, and I couldn’t pass it up. It was an honor to join such a distinguished group of women leaders to talk about how best to serve the needs of our precious resource – our youth!” said Mary Kim Titla, San Carlos Apache, UNITY’s Executive Director. The panel included Sarah Echohawk, Comanche, Executive Director of the American Indian Science and Engineering Society (AISES), Julie Garreau, Cheyenne River Sioux, Executive Director of the Cheyenne River Sioux Project and Sarah Eagle Heart, Oglala Lakota, Executive Director of Native Americans in Philanthropy. The panel discussion, moderated by Lillian Sparks, Rosebud Sioux, Wopila Consulting, LLC and NCAIED board member. (LtoR) Sarah Echohawk, Mary Kim Titla, Sarah Eagle Heart, Julie Garreau, and Lillian Sparks. RES, hosted by the National Center for American Indian Enterprise Development (NCAIED), features tribal leaders, members of Congress, federal agency representatives, state and local officials and top CEO’s on a national platform. Attendees benefit from networking opportunities, business development sessions, American Indian Artisan Market, and more. “We’ve had a wonderful partnership with the NCAIED. We co-host the annual Youth Economic Summit (YES). We get excited when a partnership provides meaningful support to Native youth and future entrepreneurs. 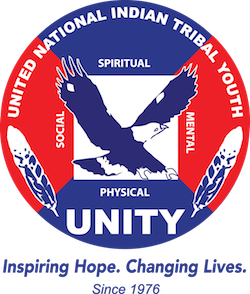 UNITY youth benefit when organizations work together to help further develop our youth’s leadership skills, and to support their journey in making a positive and impactful change in Indian country.” Titla added.